See more objects with the tag leisure, hats, tassels, accessories, headcovering, diamonds, stars, men's fashion accessories, warmth, lozenge, hat, ribbed, knit, monochromatic. See more objects with the color saddlebrown black darkgrey grey dimgrey or see all the colors for this object. This is a Cap. We acquired it in 1951. 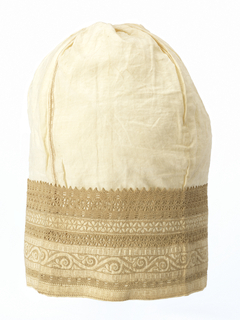 Its medium is silk and its technique is knitted cap, knotted tassel. It is a part of the Textiles department. 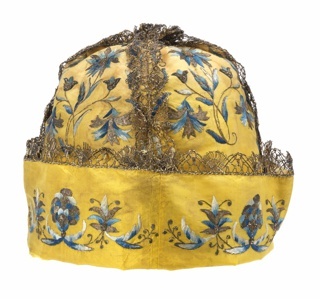 That knitted caps enjoyed great popularity in eighteenth-century Spain can be seen in the many examples in museum collections in the United States and Europe. 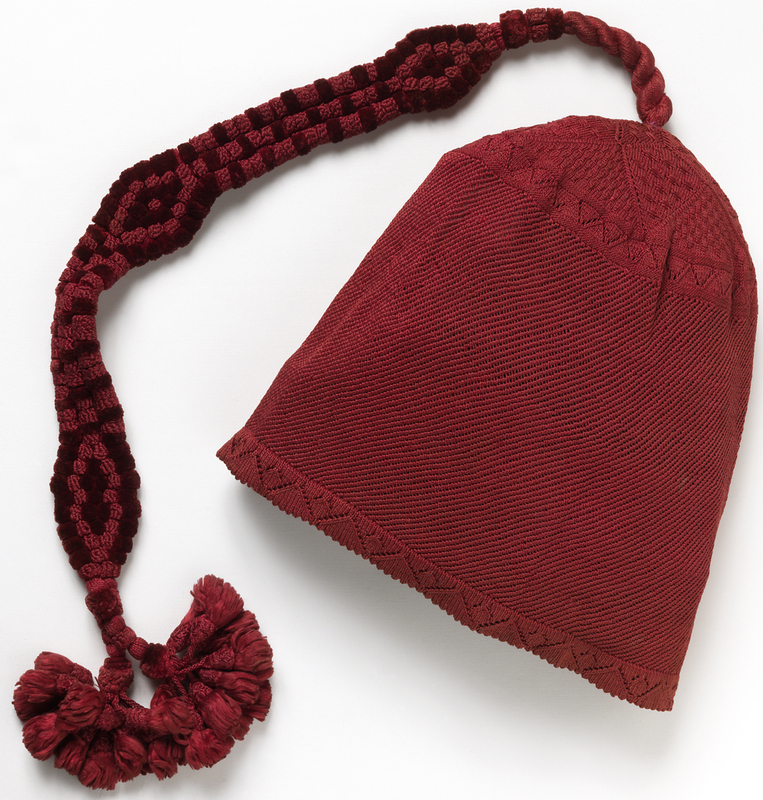 Knitted in dark red silk, this cap is primarily patterned with thin diagonal ribs while the very top has a geometric arrangement of lozenges and triangles. 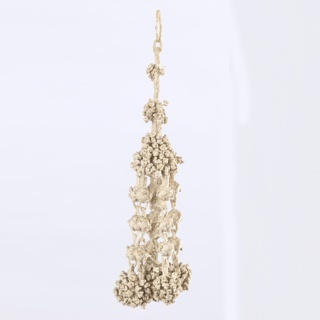 The dramatic tassel, at nearly twenty-three inches in length, is formed from two twisted skeins of yarn that have rings of knotted silk and tufted chenille attached. 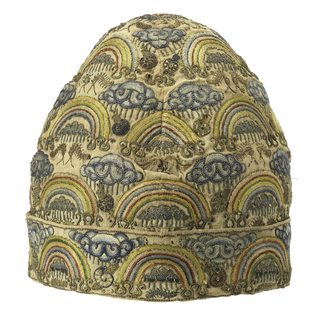 Paintings and prints from the period suggest that men and women wore these knitted caps on celebratory occasions, and that they were an important accessory of native dress in Spain. No artist expressed this innate "Spanishness" better than Francisco Goya (1746–1828), who painted lively scenes of Spaniards wearing knitted caps and other forms of traditional Spanish dress. 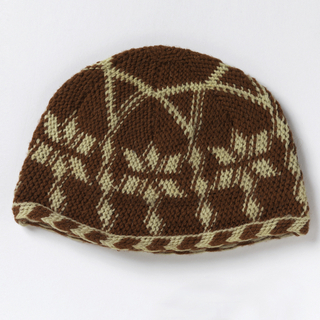 This object was featured in our Object of the Day series in a post titled A Spanish Knitted Cap. 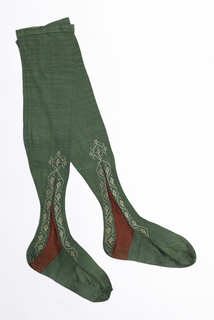 This object was donated by Richard Cranch Greenleaf (American, 1887–1961). silk, metallic yarn (silver foil wrapped around silk core), flat foil strip. Gift of Richard C. Greenleaf in memory of his mother, Adeline E. Greenleaf. Gift of Woman's Day Magazine. silk embroidery on linen foundation, linen needle lace. silk and metallic embroidery on linen foundation, metal spangles. This object was previously on display as a part of the exhibitions	Making Design and Extreme Textiles: Designing for High Performance.